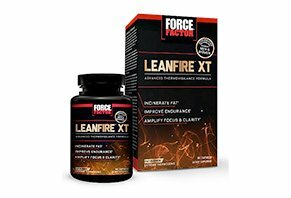 LeanFire XT by Force Factor Reviews - Is it a Scam or Legit? LeanFire XT by Force Factor is a weight loss supplement that promises to help you boost your metabolism, improve your fat burning, and increase your energy. Created by researchers trained at Harvard and Princeton, LeanFire XT by Force Factor claims to be a “scientific breakthrough” that can help melt stubborn body fat, boost energy, and improve focus. How’s it work? We’re told LeanFire XT’s key natural ingredients—delivered in their proper dose—provide something called “thermoviligence technology,” which can increase metabolism and thermogenesis, improve endurance and motivation, and heighten concentration, while keeping your mind clear and relaxed. In order to experience these benefits, the manufacturer recommends that men and women start by taking one capsule of LeanFire XT on an empty stomach in the morning. Then, if well tolerated, you can take a maximum of two capsules on an empty stomach daily, 30 minutes before a workout or meal. What happens then? According to the company, LeanFire XT will begin working, and you should notice improvements to your workouts immediately. However, they recommend that you continue taking LeanFire XT for a minimum of three months to experience its full effects. Whether this is your first experience in the wild world of nutritional supplements or your 100th, is LeanFire XT by Force Factor really “a new innovation in burning body fat,” or just more of the same old? We’ll help you learn more here. How Does LeanFire XT Work? What Is “Thermovigilence”? The LeanFire XT website dropped a lot of scientific sounding words, so let’s quickly break them down to make things a little clearer. The amount of energy contained in food is measured in calories. Macronutrients like fat contain a higher number of calories (9 calories per gram) than carbohydrates and proteins (4 calories per gram, each). After processing the foods you eat, if your body has more fats and carbohydrates than it needs, it will store them in specialized adipocytes, or fat cells. If you regularly expose your body to this calorie surplus, these fat cells will accumulate to a point where they’re visible underneath your skin. On the other hand, if you consume fewer calories than your body needs, it can use the energy stored in these fat cells as reserves, causing you to lose fat. This is the fundamental concept behind weight loss. Now, the rate at which you burn these calories and turns them into energy is based on a body-wide process called metabolism. If you increase your metabolism (such as elevating your heart rate during exercise or increasing your body temperature, known as thermogenesis), your body will burn more calories. On the flip side, your metabolism will decrease during times of rest, such as sleeping. Taken together, there’s no scientific concept known as “thermovigilance,” and the LeanFire XT website doesn’t provide any additional information. As a result, it seems to be nothing more than a marketing term created by the manufacturer. Marketing or not, though, can you expect any of LeanFire XT’s ingredients to deliver on the manufacturer’s promises? Will LeanFire XT’s Ingredients Deliver Results? Green tea is thought to contain numerous beneficial chemicals, including antioxidants and polyphenols. As a result, WebMD indicates that it might help address genital warts, high cholesterol and blood pressure, clogged arteries, osteoporosis, and more. Green tea also contains natural, mild levels of caffeine, which can help temporarily boost focus. However, WebMD doesn’t indicate green tea is effective for boosting metabolism or increasing fat loss, as claimed by LeanFire XT’s manufacturer. Cayenne pepper contains a chemical called capsaicin, which, when applied topically, WebMD lists as possibly effective for addressing different types of pain. Again, though, nothing regarding any of LeanFire XT’s claims. L-carnitine is converted by the body into nitric oxide, a gas that can help widen blood vessels and improve circulation. As a result, it might be effective for improving chest pain, reducing heart failure, and improving male infertility. Advantra Z is a proprietary version of bitter orange (formally known as citrus aurantium), a stimulant with caffeine-like effects such as blood vessel constriction, as well as increased blood pressure and heart rate. Outside of this, authoritative websites indicate there’s insufficient clinical evidence supporting any of LeanFire XT’s proposed benefits. But what about side effects? Will You Experience Any Side Effects From LeanFire XT’s Ingredients? LeanFire XT contains natural caffeine found in green tea, along with added caffeine anhydrous. So, between the caffeine and bitter orange, even if you’re not especially sensitive to stimulants, LeanFire XT seems to contain a lot. Finally, not enough is known about some ingredients, like theacrine (or the propriety version, Theacrine) and l-theanine, to fully understand possible side effects, appropriate dosages, long-term safety, and more. How Much Does LeanFire XT Cost? Is There a Free Sample or Trial? If purchased directly from the manufacturer, it seems the only way to get your hands on LeanFire XT is through Force Factor's 14-day trial, where you'll initially only pay $4.99 S&H. Along with your order, you’ll also receive the downloadable Force Factor Workout Log and Performance Cookbook PDFs as free bonuses. 14 days from your order, however, you’ll be charged the full price of $69.99. You’ll also be enrolled in Force Factor’s VIP Membership Program, which ensures you’ll continue receiving a new bottle of LeanFire XT once per month and charged $69.99 plus $4.99 each time. According to Force Factor, you can cancel your subscription at any time, without further obligation. Outside of the trial, LeanFire XT comes with a 30-day money back guarantee, less S&H, even if the bottle is empty. Important note: Per their Terms, this only applies to VIP Membership orders—all regular orders must be unopened and unused. In order to request a refund, cancel your trial, or stop your VIP enrollment, you’ll need to contact customer service. Interestingly, there were three different phone numbers on their website, depending on where we looked: 855-486-4395, 877-492-7243, or 877-204-3263. Alternately, LeanFire XT by Force Factor is priced at $99.99 through GNC (member price $69.99). Are There Other Supplements Like LeanFire XT? What About Customer Reviews? In five words? There are a whole lot. Literally, there are thousands of supplements out there claiming to accomplish the same results as LeanFire XT—many of which even feature several of the same ingredients. We’ve reviewed some of these competing weight loss supplements here at HighYa, including Zantrex Black, Slim Science, Shredz Fat Burner, and more. Overall? While some HighYa readers claimed to have experienced meaningful results (increased energy, improved weight loss, etc. ), like most, these supplements come with 2-star or lower average ratings, with common complaints citing no results, excessively high price, and difficult customer service experiences (problems cancelling trials, processing refunds, etc). Will you experience the same with LeanFire XT? There weren’t any legitimate customer reviews for the supplement at the time of our research, so there’s no way to be sure. Their VolcaNO also had a similar lack of response. However, Force Factor’s Test X180 supplement had a 1-star average review here on HighYa, with most complaining about a lack of results and/or problems with the “free” trial. Again, this isn’t to say you’ll experience the same. Instead, our only intent here is to provide you with a high-level overview of the situation. Will LeanFire XT Ignite Your Metabolism & Deliver Fat Loss Success? Bottom line? While everyone’s body is different, the fact of the matter is that nutritional supplements can’t cause major changes in the body. Why? Because if they did, they’d be classified as drugs by the FDA and subjected to much stricter regulatory oversight. Additionally, based on what we learned from authoritative websites like WebMD, it seems that, while some of LeanFire XT’s ingredients might provide some unrelated benefits, there’s insufficient clinical evidence showing they can deliver on the manufacturer’s lofty claims. Does this mean you shouldn't purchase LeanFire XT from Force Factor? You're an adult, so we're not here to tell you how to spend your hard-earned money. But based on the lack of clinical evidence for its ingredients, along with its fairly high price and autoship enrollment, we’d definitely recommend speaking with your doctor before placing your order. Did you order LeanFire XT? Did it work for you, or was it a flop? Give us the details in your review below! All these people do is take your money 18 days from when you place order, and you don't get produce for over a week, and then they charge you. And the pills are junk, and the customer service is rude - one says still on trial, and then they bill you after you cancel the day before! And the customer service thinks they are important and scared to give Corporate's number because they lie! Jason, number 2000, is a joke. I hope that you are reading this BEFORE you accept the "so-called" trial they have because they WILL absolutely charge you BEFORE your scheduled date. I had absolutely no idea they had already charged my card until I called in to cancel to avoid being charged on the date they stated I would be charged, on which was 10/29. So I call in on 10/26, three days ahead of time, which is plenty of time to cancel, and I'm told that they just charged me $74.95 today. And I was told that I would be charged on 10/26 and that I must have mistaken the 6 for a 9, but they can cancel it going forward, and I'll get a refund when I send in the bottle they have already shipped (supposedly). But you see, I have not received an email stating that another bottle has been shipped, and an email was sent to me the day they shipped the trial bottle, so I know nothing has gone out as of yet, so they could easily still cancel the crap and refund me my entire $74.95 that they STOLE! But no, the representative will tell you that they can only give you 60% of your money back now, or you will just have to wait until the next bottle arrives and send it back for a full refund, meaning you will have to wait several weeks if not a month for your money back because like I said, that bottle was NOT shipped to me today, and if you're anything like me, who happens to live on a budget, I don't have that kind of time to wait. I have kids I have to feed, and my rent is due to keep a roof over their heads, but I am the one who is having to bend over and take it because they charged me early! SO, I ask for a supervisor and I said, "It was stated that I would not be charged until 10/29 and I want a refund since you charged me on 10/26 and the supervisor's exact words were, "Well, that's not going to happen because this is an 18-day trial and if you count 18 days from the day you signed up for the trial then that would actually put you at 10/24." So I'm like, then why was I told 10/29, and she basically called me a liar saying that I wasn't told that and she refused to help me whatsoever! In fact she hung up on me. This is a supervisor representing this company! This company has to be a joke and out to do nothing but rip people off! It's supposed to give you energy, but yet my husband took one and fell asleep an hour later, so again, nothing but liars and thieves! Please save yourself the heartache and the money and DON'T make the same mistake I did! Plus how can you say it's an 18-day trial and start the trial before you even ship the product? That's not a FULL 18-day period the consumer is getting to actually take the product. It's just all a lie and a way to steal from people, and then once they have your money, there is nothing you can do about it because they have supervisors like that working for them who will just say too bad, you're not getting a refund, and you're not canceling either, and then hang up on you. So, now I guess I get to go and cancel my card and get a new one too, on top of losing $75 for nothing when I did what I was supposed to and called in plenty enough of time to cancel my trial before I was supposed to be charged. That is not right, and I hope someone figures out how to shut this company down before they are able to take advantage of too many more people. Do not buy, will charge card unauthorized charges! This is a scam, do not buy the free trial. I was told I have 18 days and I have yet to receive the free bottle, and a week later my card was charged almost $80. I was told once I receive the shipment to send it back with an RA number, and I have to pay for the shipping. Bad company to do business with. Just go to GNC. I am 50 years old. To take these pills, you first have to constantly exercise every time you consume them, not have any heart problems, not have nervous systems problems, eat very healthy, suspend dinner, eat nothing after 7 pm, no junk food or features, nothing that contains caffeine, and these pills will work and burn fat if you do all this. Good! This is not miraculous if you take it and do not make an effort to control your appetite and you not do everything I told you first. You will not see results and you could have tachycardia, beware!! The metabolism changes, so careful! You have to focus on exercise, it makes you choleric, and you have control. I am addicted to these type of pills and learned to control myself and to think that if I take them I have to do exercise, it works in me. I have energy in everything I do awake with more concentration. I do not forget things, it is also important to mention that we all have a different metabolism, I gained weight when I got married, I was waist size 28, and I went up to waist size 34. My doctor told me that I had high cholesterol, and I need to suspend high-fat foods, but I also did not feel the same energy and started to research weight loss pills. I started taking them, I lost weight and I have incredible energy as 20 years old boy. I went back to my normal waist, and now I am 29 or 30. I feel very good about myself, as I am more healthy and my cholesterol has disappeared. Many do not mention what happens to them at the beginning, it was not easy to control the new thing that happened when I was taking these type of pills, but I have a lot of control of not exceeding what is recommended. I'm not getting angry, and I'm not taking them for no reason, anything that contains caffeine. It has been already 16 years that I have taken these type of pills. The new ones that come to the market, I have my doctor check periodically, and everything is fine, thanks to God! LeanFire Force Factor works very well in me, I am a person who tells the truth about my experience, and despite that, I have lost weight. For many years, I stay the same size, and I have no side effects. So be careful if you do not exercise and do not eat healthy, if you have heart problems, nerve problems or high blood pressure, do not take them. As I told you, it is not miraculous, you have to put the willpower and you will see results. It is definitely a scam. I tried it for two months and it did absolutely nothing! They talked me into the second month saying they would refund the cost if it didn't work. When I called for a refund, they refused. They just tried to sell me a different product. What a scam! I took this product for one week and I was so sick. I tried it with food, without food, I exercised, and I was so nauseated and jittery I felt like rubber. It gave me no energy, but it turned my stomach upside down. Several times I thought my heart would come out my chest, which is very, very scary. I trashed them and vowed never to use anything of this nature again. I tried it, and it did give me energy, however, it made me feel like my brain was scrambled. I couldn't concentrate, and it made me waste a whole day of work after I exercised that morning because I could not get it together. I tried this both on an empty stomach as the directions state and with food. Both ways made me physically ill. I felt nauseous, sweating, rapid heartbeat, and I mean very rapid, lightheaded, shaking, it was so bad that I nearly went to the hospital when I took it on an empty stomach. I called them and they suggested taking it with food, but that didn't help that much. Obviously I can't take it, so no weight loss, and I don't think it is safe at all. Listen to WebMD, seriously. I am losing weight on my own. It's slow, but I don't feel like I am going to die. Am I the only person who has gained weight while using this product? I have been taking this for six weeks and have gained about 10 pounds. I work out daily and have not changed my diet. I tried this product based solely on the hourly advertisements on Pandora and used it for two months. As background, I already consume large amounts of caffeine, including four cups of black tea and two Diet Mt. Dews daily, so my caffeine tolerance is higher than average. Taking two pills per day made no noticeable difference, either in fat burning, weight loss, heart rate, or energy. In fact, I can take a pill and then take a nap two hours later without a problem. I do not recommend this product for those with high caffeine tolerances. Write a Review for LeanFire XT by Force Factor!